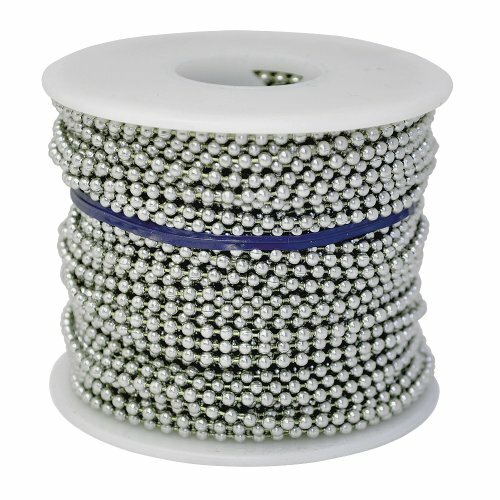 100 foot spool of aluminum ball chain, #6 size (bead diameter of 1/8" or 3.2 mm) made with lightweight and rustproof aluminum. This product is genuine Ball Chain direct from the manufacturer - Ball Chain Manufacturing in Mount Vernon, NY - which means that it is made in the USA and is the highest quality in the world. Ball Chain connectors are used to join ends of ball chain together to form loops such as those in neck chains, dog tag chains, key chains, bracelets, and custom chain assemblies. 'B' Couplings are used as connectors for larger chain sizes (*regular connectors are available up to size 8 chain, so for size 10 chain and above, select 'B' Couplings). Ball Chain Manufacturing is ISO 9001:2008 certified by the International Organization for Standardization and is also recognized by the Green Business Bureau as a certified "green business". Ball Chain Manufacturing is the largest manufacturer of Ball Chain in the world and the only company that manufactures its chain in the United States. Our chain is everywhere, and our quality is second to none. Don't settle for low quality overseas imitations. Whatever the application, this chain will last. Made in USA by Ball Chain Manufacturing Since 1938. We are the manufacturer, not a reseller. Manufacturer: Ball Chain Manufacturing Co., Inc. Publisher: Ball Chain Manufacturing Co., Inc. Studio: Ball Chain Manufacturing Co., Inc. If you have any questions about this product by Ball Chain Manufacturing, contact us by completing and submitting the form below. If you are looking for a specif part number, please include it with your message.